If the leaves are turning, and the air is crisp, it must mean that most august of traditions has returned. That's right -- the Tournament of Pizza, sponsored by Sunmark Federal Credit Union, is back. Lots of plotlines for this year's field: Can 5th and 50 repeat as TOP champ? Will this finally be DeFazio's year? Who are the mystery entrants in this year's field? Scroll all the way up for the brackets in graphic form. Also, here's a printable version of the brackets (pdf), if you're so inclined. + As is TOP tradition, the winner of each bracket from last year gets an automatic bid for this year's tournament. + Crowd voting filled another slot in each bracket. + The selection committee (that is, the Editors) picked a group of "tough luck" losers from previous years for inclusion in this year's field. These are shops that posted solid, even very good, scores in previous tournaments, but for whatever reason didn't win their brackets. + Each bracket also includes a mystery entrant, known only to the selection committee. These entrants will be revealed when/if they lose in each bracket. This year's TOP again includes pool play in the first round, not head-to-head matchups. The four pizzas in each bracket compete in the first round for two slots in the second round -- highest scoring shops advance. 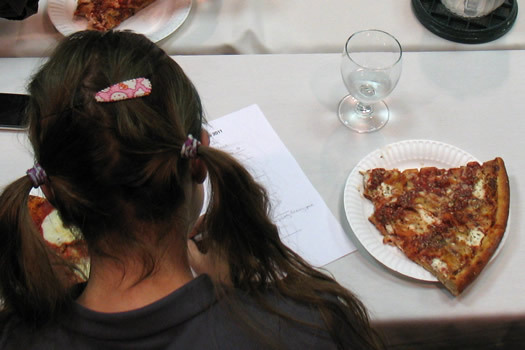 About scoring this year: Pizzas will again be tasted blind (that is, the judge don't know where the pizza's from) and scored on the 100 point scale -- 100 being a pizza that achieves the highest possible score in each category: crust, sauce, toppings, overall taste. Previously this has meant that each judge was responsible for 25 of the possible 100 points for each pizza. But this year's TOP includes a panel of five judges (listed below). So each pizza's score will be its total points as a percentage of 125. The mysterious lady behind Albany Eats. She's the only judge to have participated in every TOP. You know him from the FUSSYlittleBLOG and Eat This! on AOA. The one and only derryX. Troy resident, geek, connoisseur of the slice, one of the original TOP judges. We're very happy to have him back on the panel. Almost foodie with a remarkable memory for pizza, and one of the original TOP judges. It's great to have her back. This Saratoga Springs shop posted a series of fantastic scores last year... until the semi-final, when a dud pizza at the wrong time allowed DeFazio's to coast in the final. A longtime Saratoga favorite returns to the TOP. It lost to Nunzio's in the first round in 2010. Amore occupies the location once inhabited by former bracket champ Nunzio's. And it came very close to beating Mama Mia's for a spot in the semi-finals last year, losing by just 4 points. If not for some underdone crust, it probably would have been in the semis. Hint: its crust is one of its signatures. This Scotia shop made a huge splash in its first TOP, winning the whole thing last year. Can it repeat? Nico's was the runner-up in this year's Schenectady crowd voting. But the shop in first place -- Pizza King -- was not open at the time the field was set, due to the recent death of its owner, and it wasn't clear if it would be re-opening. It's almost not the TOP without the King. This Niskayuna pizza place was thisclose to advancing to the second round last year. It tied eventual tournament champ 5th and 50 in Round 1 pool play, but lost on the tie breaker. You could make the case that DeFazio's has been the best performing shop in the history of the TOP. Yet it's never won the title, losing in the final the last two years. Maybe this is the year. This pizza place, located below Daisy Baker's in Troy, has never been in the TOP. Overwhelming crowd voting earned it a spot this year -- it got 29 percent of the vote in Troy, and more than twice the number of total votes as any other shop in all the crowd voting. This shop on 4th Street in Troy has passionate fans. And it has managed to post a string of solid scores. Maybe this is the year I Love can put it all together. Hint: not your father's pizza. This Guilderland shop had a good run last year -- but it just couldn't overcome 5th and 50 in the semi-final (the judges thought its topping held it back). Could be a savvy pick for this year's title. An old-school tavern favorite from Albany's New Scotland neighborhood. Its last appearance in the TOP -- in 2010 -- ended with a hard-fought loss to Paesan's in the first round. Maybe this is the year a tavern pizza breaks through. This downtown Albany shop came up just short to Marisa's in Round 2 last year, 75-66. The match was a lot closer than it looked, though -- a point or two different in each category and Sapienza would scored a win. Let's see if it can get tasty payback. Hint: good for big appetites. Results start Tuesday. Get ready. Many thanks to Sunmark Federal Credit Union for again sponsoring the Tournament of Pizza. Sunmark's continued support helps make the TOP possible. I'm guessing that the mystery pizza from Saratoga is from Capriccio. It's phenomenal. The real ALbany mystery: Where is Victoria?! I'm feeling like a loser! A hungry loser. I can't believe how many of these places I don't know. 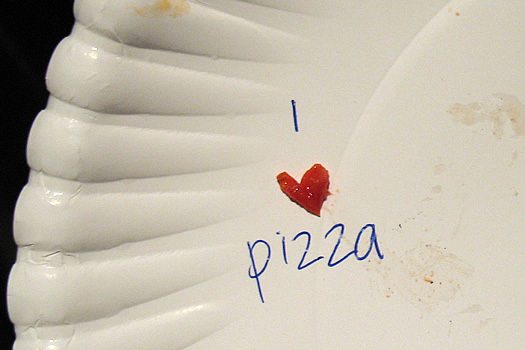 I love pizza. I guess I need to get out from under my rock and try some new pizza restaurants. Solid field in the Troy bracket. Can't wait to find out who the mystery pizza but I can't think of a place that can hold a candle to DeFazios or Bacchus... The COB from Red Front? Bummer, I was hoping to see how Ottimo's pizza (new) fared in the competition!!! We have used a couple Groupons there and LOVE the pizza. Wings not so much. Where will this tournament be taking place? HUGH fan of Bacchus (for about the last 4+ years), but i am afraid for its delicious, delicate crust being transported in cardboard and not being eaten right out of the "god's mouth" as nature intended. oh pizza, i love you. can't wait to see how this turns out.